Why am I a scientist? That the world was my experimental stage. They could have blanked me with a sigh. Where I spent hours at the Eureka! They’d hold tight to my hand from light until dark. From behind the confines of their translucent mausoleums. What they did with their poo. And exactly what it was about the Saragossa Sea that made it so attractive to eels. As we journeyed across the Universe via blackholes and supernovae. My result would have changed. 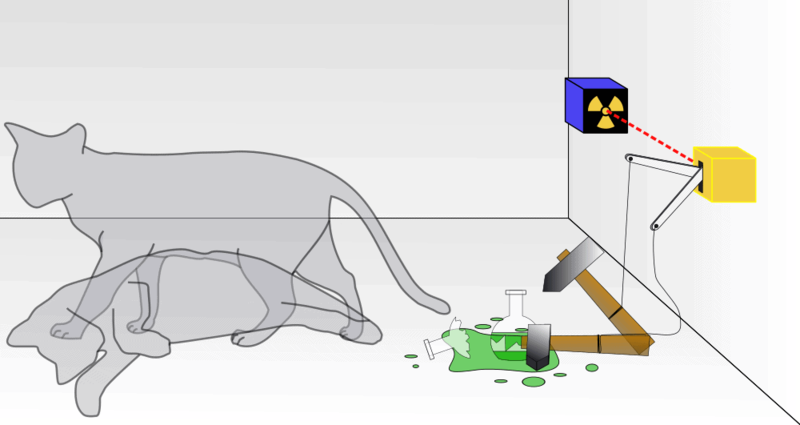 Diagram of the Schrödinger’s cat thought experiment (Image Credit: Dhatfield, CC BY-SA 3.0, from Wikimedia Commons). I was inspired to write this poem by Merck’s ‘Always Curious’ initiative, which is in celebration of the company’s 350th anniversary. Over this time Merck have helped to make a difference to the lives of people across the globe via innovative medicines, vaccines, and animal health products. These innovations have in turn been developed by scientists through a combination of perseverance, perspiration, and inspiration. Inspired by this scientific curiosity, I wanted to write a poem which reflected my own curiosity as a scientist, but which also celebrated the support that I have received in pursuing these endeavours. The Always Curious initiative is focussed around imagining what the next 350 years of scientific development might look like and in my opinion, this will depend to a large extent on the support that is made available to ensure that everybody has the same opportunities to be curious, and that they are encouraged throughout this process. I am incredibly grateful that I received this support, and I hope that I can now inspire and enable others to both look inside and think outside the box. Disclaimer: This post has been produced in cooperation with Merck.